The music album of every film is nowadays is incomplete without reviving a hit nostalgic track. And looks like Kartik Aaryan’s next is all set for a chartbuster which will serve as a blast from the past. Kartik’s next film Luka Chuppi with Kriti Sanon is going to rewind Akshay Kumar’s hit track ‘ Yeh Khabar Chapwa Do Akhbar Mein’ from Aflatoon. The song was a hit number back then and the makers thought that it will be perfect for this film since their lead Kartik plays a reporter. Kartik Aaryan plays a television reporter in the film and he’s the perfect boy-next-door. This song, which was earlier picturized on Akshay Kumar and Urmila Matondkar, will now be filmed on Kartik, Kriti Sanon and Pankaj Tripathi. 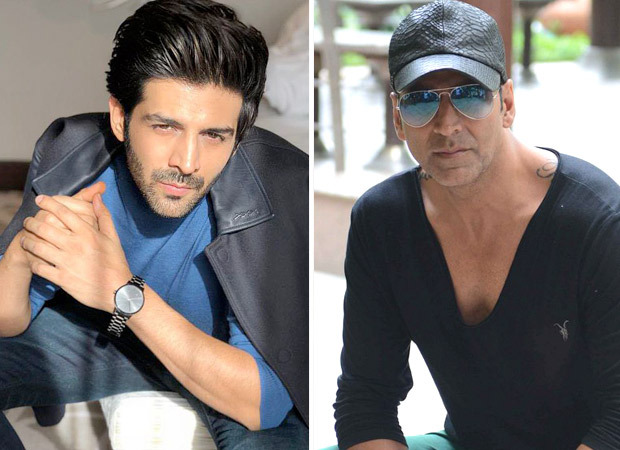 Kartik has always idolized Akshay Kumar and loved the superstar. So, he was quite excited to perform on this song. The actor had taken to his Instagram account to share some videos and pictures of his strenuous dance rehearsals in the past few days but didn’t reveal anything about it. Now, we know that all that hard work was for this Akshay Kumar song. The song was shot in a Vasai studio on Monday and Tuesday and the actor had a blast putting on his dancing shoes for this hit track. Last year, Kartik Aaryan made the entire nation dance to his songs – ‘Dil Chori’ and ‘Bom Diggy’ which were chartbusters. Luka Chuppi stars Kriti Sanon and Aparshakti Khurrana and is set to release on March 1, 2019. Brahmastra – Amitabh Bachchan and Ranbir Kapoor to groove together in this song from the film!